'Effort, result" was her work ethic these words were repeated throughout Part 1, Becoming Me. The elongated details of her education life, however, were important stories for the anchor of the story, this set up was the background material for the context of the book. When in her young adult life we see her face challenges in career choices and all life's concerns we know her nature from the becoming me reading. Taking out the childhood stories of Craig and herself playing with their father we would have missed her sentimental side, leaving us with a representation of an ambitious young lady without a cultural identity. Her cultural identity was something she was very proud of mentioning being raised in "Southside Chigaco" at any instance. 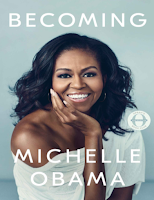 She falls back to reflect on this area of her life in Part 2 as she becomes us, the part of the story where her life entwins with Barack Obama. The intention is clear to show and inspire readers that all is possible, her father having a disability, low-income family, and the inequalities in her primary school were not barriers for her to be "reaching" she writes to encourage the millions of others just like her. Michelle seems to have it all, elite education, progressive career and then meeting, falling in love and marriage to her soul mate Barack before creating their family. Yet she shares the struggles of becoming pregnant, and the more responsibility on her being the woman in this matter whilst her husband runs up and down campaigning. It's these home truths, sentimental stories that make her an author, opening up and becoming vulnerable to the world with her dilemmas. Losing her father and her best friend to poor health was also touching. Yet in becoming us, she shares her marriage being in a crisis and needing counseling support. Her husband who loved "the hole" to go and hide away, particularly when on writing assignments left her - a people person- feeling abandoned, whilst it was therapy for him. Despite their problems, they surmounted them and remained a team, knowing that they had duties of becoming more. The final part 'Becoming More' we see her in full swing, fully immersed in her role as First Lady, being on their second term in office, more confident, more determined and more will for the people. She knows she stands on shoulders of the giants that went before her e.g. Sojourner Truth, without any of there activism, her story wouldn't exist. She continues to use her voice for the voiceless and empowering 'invisible" women, black women. Essentially she wanted the best for all people of her nation, regardless of race, gender, and sexuality; breaking security protocol to celebrate marriage equality Gay Pride lights at the White House. Although not a fan of politics, she campaigned wholeheartedly to see another woman as America's President, Hilary Clinton because she thought she was qualified to be the next President. Meeting Queen Elizabeth when coming to England was a revelation, the two of them becoming friends and the queen also breaking protocol asking to sit with Michelle where Barack should have been seated. I resonated with them both complaining about wearing shoes and tired hurt feet, which I've written about in my memoir. The most nerve-racking story told was reading about the wild cats coming to visit them at the white house, here I see Michelle's sense of humor and imagination. Overall her work has the first lady has made a grand impact, her love of children motivated her to work on obesity campaigns and encouraging them to move, reducing the statistics significantly, as well as keeping her promise to war veterans. Combined with the public role she doted heavily on her children and portrays a loving and dedicated mother, juggling both successfully. Key points that stood boldly in the becoming story were love and sacrifice, if not for her mothers love and sacrifice the road would have been more rough to become what she was. Her love for her husband, she talks about learning how to love, and the sacrifice her husband endured being a national leader, is summarised as love.